Brazil: No to Lula’s Arrest, Down with the Coup d’Etat, Temer Out Now! Judge Sergio Moro has just ordered Lula to be arrested, less than 24 hours after the Federal Supreme Court’s shameless and illegal decision, by a vote of 6 to 5, to deny him habeas corpus. This is the proof that the fraudulent coup d’état that swept President Dilma’s legitimately elected government from power, setting up a puppet government in its place, marches on. Finance capital, the major national and multinational economic groups, the Trump administration, and others of this ilk need to intensify the coup d’état in order to get their hands on the nation’s wealth, be it the deep-water oil fields or our public companies, and to profit from the cheap labour of workers who have no rights. The continuation of the corrupt Temer government gives the right wing, which is in a minority, the possibility of continuing to govern in favour of such reactionary institutions as the National Congress, which approved the “reform” of labour legislation that cuts workers’ rights, or the Supreme Court, whose decisions obey the political requirements of economic power. Down with the Coup d’état, Temer Out Now! It is the coup d’état and the putschist institutions that are threatening sovereignty, social rights and democracy. It is the toxic remnants of the authoritarian dictatorship, which still endure in the 1988 Constitution, that have allowed these institutions to survive, even though they are in contradiction with the aspirations of the majority of the people, even though they are hated and rejected by practically the entire population. General Villas Boas, commander of the army, announced the threat of military intervention if the Supreme Court approved habeas corpus for Lula. For him, any stance favouring Lula, no matter how legal, would be impunity. But how can this general speak of impunity when the crimes of the military dictatorship, assassinations and crimes of corruption remain unpunished to this day, with legal cover from the Supreme Court? The execution of PSOL councilwoman Marielle was the result of military intervention by the armed forces in Rio de Janeiro, decided by Temer, a barbaric crime that remains unsolved. The continuation and intensification of police militarisation is feeding a wave of repression and murder of poor young Blacks in the favelas. The sponsors of Marielle’s assassination must be put behind bars, not Lula, who has been sentenced to prison without an iota of proof. The backdrop to this new stage in the Brazilian coup d’état is the will to keep Lula from standing as candidate in the next presidential elections, as the polls are calling him the favourite to win. Electoral fraud is not rare in Latin America. Very recently, shameless electoral fraud was committed in Honduras. U.S. imperialism despises the sovereignty of peoples and their aspiration to self-determination. This is what explains Trump’s economic pressure and threats of military intervention in Venezuela. 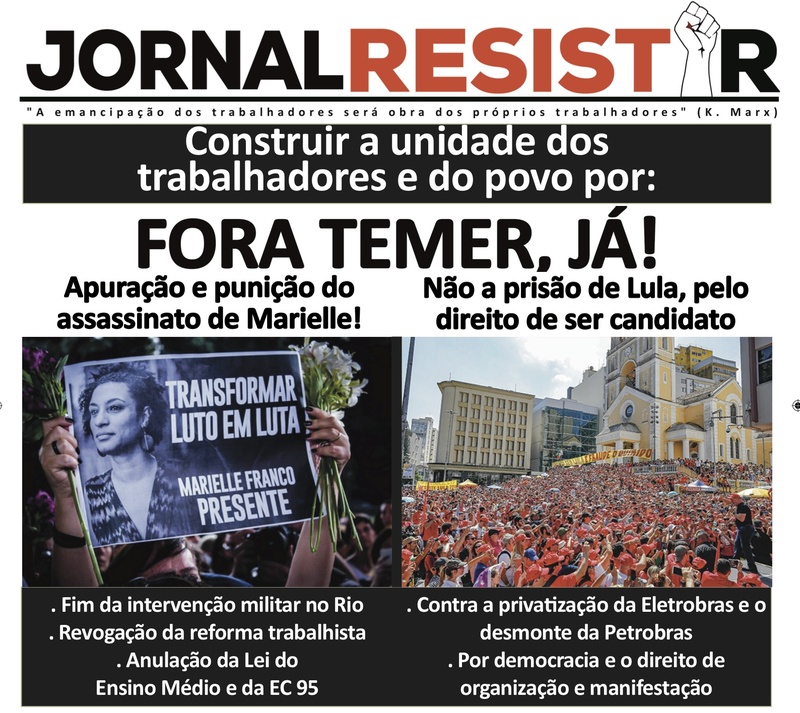 Lula’s arrest, of course, is an attack against all the labour organisations in the cities and countryside – against all the parties, the trade unions, the landless movement, the homeless movement and student associations. Consequently, the broadest unity is needed to fight against the jailing of Lula. Democracy must be defended, and the fight must be waged for a sovereign Constituent Assembly, in order to put an end to the reactionary institutions in place, institutions that only serve to guarantee the privileges of a few at the expense of the aspirations of the majority. No to the arrest of Lula. Defend his right to be a candidate! Temer out now. Down with the putschist institutions that act against democracy and rights! End the military intervention in Rio; investigate and punish the assassins of Marielle and Anderson! Sovereign Constituent Assembly to repeal Temer’s measures*, to defend democracy and to advance social gains! *Repeal of the labour law “reforms”, of the law on secondary education, of the EC95 that freezes social spending for 20 years, of the removal of control over Petrobas, the deep-water fields, etc.